Are you feeling lucky? 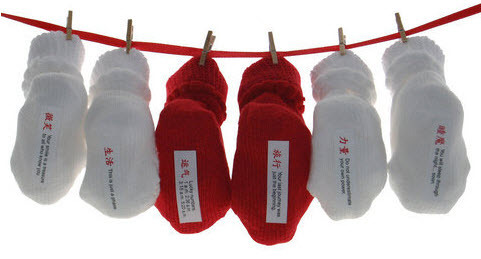 Cute predictions about life, luck and power come with Fortune Tootsies’ cuter-than-cute baby socks. 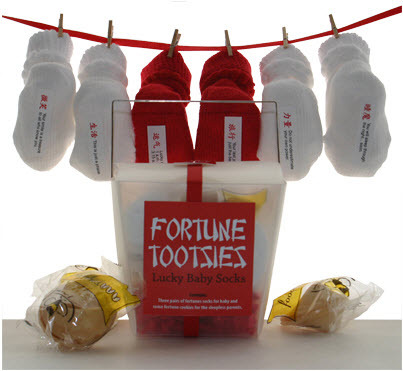 Each take-out box of Fortune Tootsies comes with two pairs of white socks, one pair of red socks and fortune cookies for mum and dad. So whilst new parents may not initially see the humour in the fortunes ‘Lucky numbers: 1 a.m. 2:36 a.m.3:15 a.m. 5:20 a.m’ and ‘You will sleep through the night… soon’, they will appreciate ‘This is just a phase’. Fortune Tootsies are sized up to eighteen months and are US$18.95. They are available from Present by Design, who ship internationally.